It’s not up to men to decide what time they have. It’s up to men to decide what to do with the time they have been given. “Just get to mile 1 and see how you feel” is the first thing I told myself when the alarm went off at 4 AM. Of course the comfy bed would feel preferable to running 50 miles, so I had to make sure I got moving and gave this thing a fair shot before deciding if I wasn’t fit for duty. So I ate my toast with peanut butter and honey and drove the 45 minutes to Lakewood with the mindset that I was running this race. I had been sick all week with a low fever and green stuff coming out of my lungs. On race day (and even now 4 days later) I was sporting the fever. 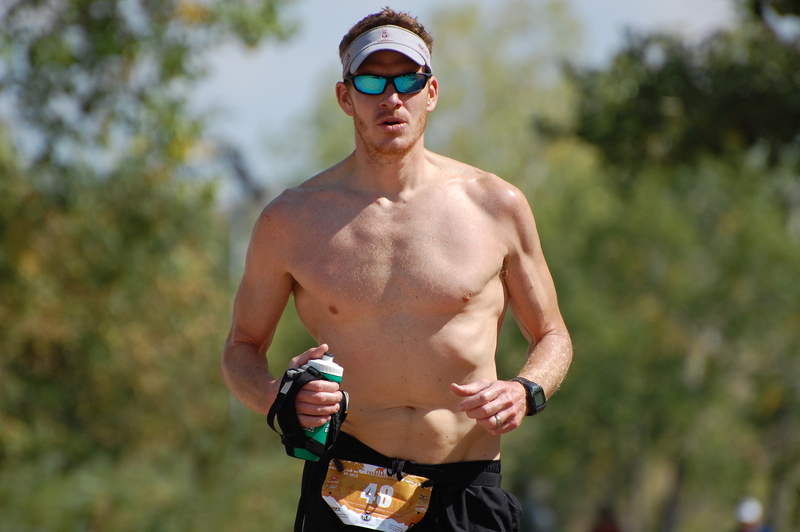 If it was a training weekend I would not have trained, but this was a race weekend, and if I was going to run 50 miles for the first time, it had to be this race. With the latest addition to our family in February, the first half of the summer was spent doing family things with little training and no racing. The informal agreement was that in the back half of the summer I could cut my teeth on a few ultra trail runs and walk away from 2012 having raced little, but completed things I’ve never even attempted before. 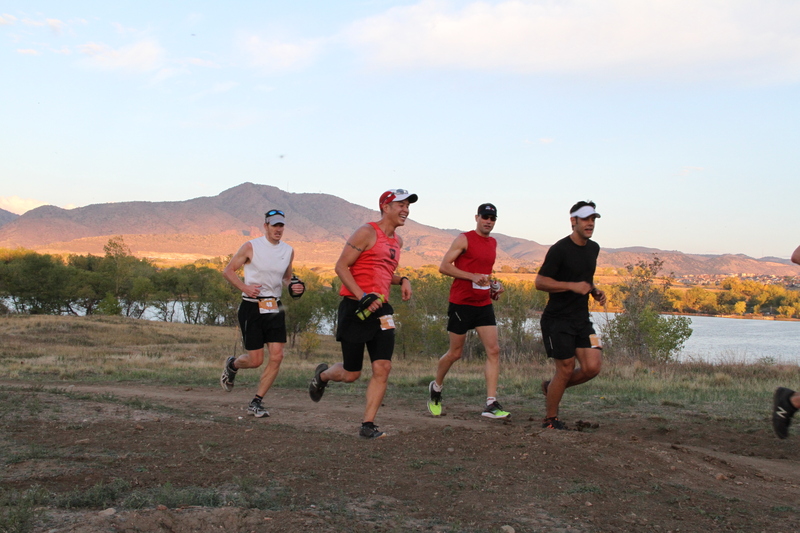 There are no other 50 mile races left this year within an 8 hour drive of Boulder. And even if there was, I couldn’t just wait for another race a few months later because training time is a luxury I do not have at the moment. I spent all my training time funds already and my account balance was at zero. It had to be this race or no race. And while I wasn’t thrilled to try my first 50 mile run with Zicam in my drop bag, this was the situation I was in. And the pain of running 50 miles while not feeling well would be far less than the pain walking around Sunday and not running the 50 miles. And so I just wanted to get to mile 1 and see. 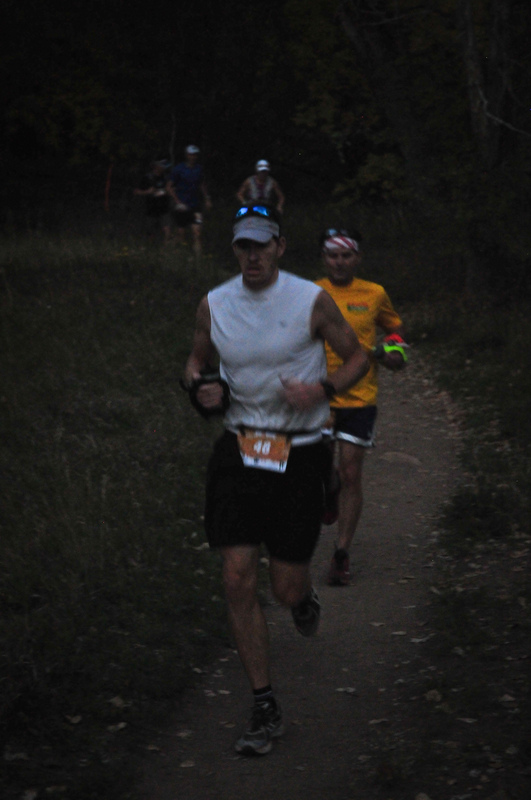 The race director had the timing dialed in perfectly with the gun going off at 6:30 with just barely enough light to see the trail. Of course, I was still rooting around in my bag as the race started, but I managed to cross the starting line only a few seconds late. The first few steps felt good and I started to believe. If I tried to take a deep breath I would fall into a coughing frenzy, but easy shallow breathing seemed to work, and I definitely felt better than all of my “runs” during the week that disintegrated into dejected walking and even sitting time wastes of crappiness. So the fact I was running at all was no small accomplishment and a welcomed surprise. When I hit the one mile mark, I knew that unless I injured myself, I was going to finish. I was above whatever threshold you need to be to run 50 miles (which is part physical and part being mentally deranged I believe). Normally when I run, to make the effort not seem so bad I hit the one mile mark and say “only 9 more of those and I am done” or “just do that 5 more times and that’s it”. As I passed 1 mile I said to myself “only 49 more of those and I am done.” I got a little depressed and I stopped playing that game. 49 of anything is too many. The course was fairly tame with only one signification climb on each of the four loops with 3400 feet of total elevation. I settled in with a group of guys running just under a 9 minute mile pace. It felt easy and comfy. It’s hard to believe that you could say a 9 minute mile might be too fast, but I was worried it might be too fast! It’s pretty hard to assess how the steps you are taking now might impact you 9 hours later. Overall I felt good and sucked throat lozenges in between aid stations and occasionally hacked up goofy stuff that had made its way into my throat. The main thing was that I was “good enough” to race and I wasn’t going to squander this chance. Eventually I found myself at the back of a train led by a fairly fit looking lady and I figured that was a good spot. Women generally seem to have the best sense of pacing. Maybe they don’t have quite the bravado and ego that men do? Either way, judging by her calves, I could tell this was someone I should not be passing and she helped the last miles of loop 1 fly by. I hit the start/finish of the 12.5 mile first lap in 1:52. I was definitely ahead of schedule. Loop two was much of the same except now the 50K folks were on the course. It took me a while to figure out what was going on and the first few people I passed I was thinking “how in the world did that guy out run me the first lap!?! ?” I hit the significant climb at the midway point of the lap and on the way down is when I felt the first signs of a fatigue. I was about 18 miles in and I still felt good, but the battle was beginning in earnest now. Just after the descent there are 3 stream crossings which made it……interesting. Some chose to go a little down the stream to try to hop across on rocks but most just blasted in. I blasted in and took a brief moment to splash my head, arms and legs. Refreshing! Then of course it was a couple miles of squishy running. I hit the 25 mile halfway mark in 3:58. Based on time I was doing great, but I was way more tired at this point than I planned to be so I had to “adjust” some expectations going forward. I knew going in that the 3rd loop would be the hardest. I can’t tell myself “last lap”. It’s not an out and back so I can’t say “ok, headed for home!” The lap covers miles 25 – 37.5 which aren’t close enough to home to be motivating, but are enough miles to be exhausting. So I took a good 5 minute walk break to kick it off and didn’t pressure myself to run a certain pace or try to avoid any walk breaks. I just tried to move forward while taxing myself as little as possible. And that sounds good and all, but it still felt like crap! My pace slowed considerably and I finish loop three at 6:44 total time with a 2:45 lap split. The one thing going in my favor was that I had absolutely no chaffing, blisters, sunburn, corns, calluses, bunions, Ebola, elephantitis of the face, shingles, weak stream, whooping cough or paper cuts. I fully expected that sort of “collateral damage” to be the hardest part of the race. But other than a small blister on my foot that didn’t even hurt until mile 49 I was entirely free of all those things which was HUGE. For the last lap I switched my watch over to total distance instead of lap distance, mainly because I thought it was cool to see 40+ miles on it. 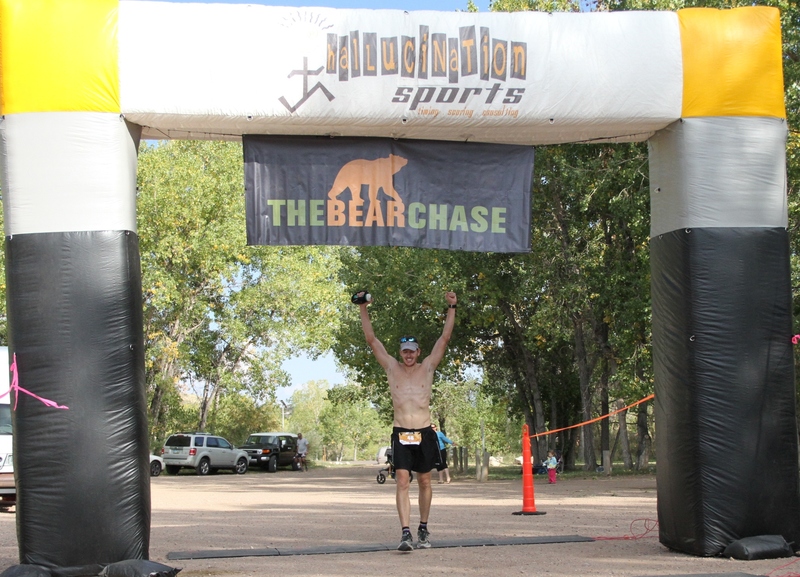 Barring a catastrophe I was going to safely beat any cutoff times, so my goal was just to cover the last miles while not putting myself at risk for any type injury or circumstance that would jeopardize the finish. It seems silly to have covered 45 miles, but still question if you can cover the last 5, but a finish still seemed in doubt up until seeing the finishing chute. It wasn’t just about muscular fatigue. My joints hurt. My bones hurt. I had this fear that something would just stop working and I’d crumple into a heap on the side of the trail. Towards the end I was doing about the same amount of walking as running and I was really really tired. A few times I just stopped and put my hands on my knees just to give my quads a break for a few seconds. I did not dare sit because if I sat I knew that I would probably not stand again for a very long time. Lap 3 mile 30. Let the pains begin! At mile 49 a guy passed me and asked if I needed anything. He asked if I wanted to run with him and finish together. I told him to just go on ahead and run his race and that I’d be fine. He apologized for passing me! I said, “look dude, this race! Passing people is exactly what you are supposed to do. No apology is needed.” As he pulled away I started thinking of an Ironman a few years ago where towards the end of the bike leg a guy pulled in front of me an proceeded to take a leak and spray me and other cyclist as well as spectators. Never mind that in two minutes he’d be in a changing tent with bathrooms. The guy was too “completive” to waste time in a bathroom so he chose to piss on people. And here was this fellow in a trail run apologizing for passing me. It’s certainly not an absolute that tri folks are jerks and trail folks are great, but there is absolutely a different vibe at these races. There is much more of a “we are in this together” mentality instead of “hey, there is a guy in a red shirt…..I am going to take a leak on him!” And that’s pretty cool. There is a quad pounding downhill just before the finish that went something like this “Ow! Ow! Ow! Ow! Ow! Ow! Ow! Ow! Ow! Ow! Ow! Ow!” And then as I rounded a corner I saw the most glorious thing I had seen all day…..the finish! I was filled with a deep sense of satisfaction that I haven’t experienced in a while. I can’t think of the last race I started where I truly wasn’t sure if I could finish. Chasing the finish line instead of chasing seconds here and there is an altogether different experience. And given the last 7 months with the endless sleepless nights dealing with an infant, the stress and busyness of a new life with two small kids, the uncertainty with sickness and injury leading up the race, I had truly reached the finish line of a long, hard and unpredictable journey. And I was pretty happy about that. 9 hour 43 minute finish. Great narrative, Mike. Who took the pictures? They had a course photographer as part of the race. 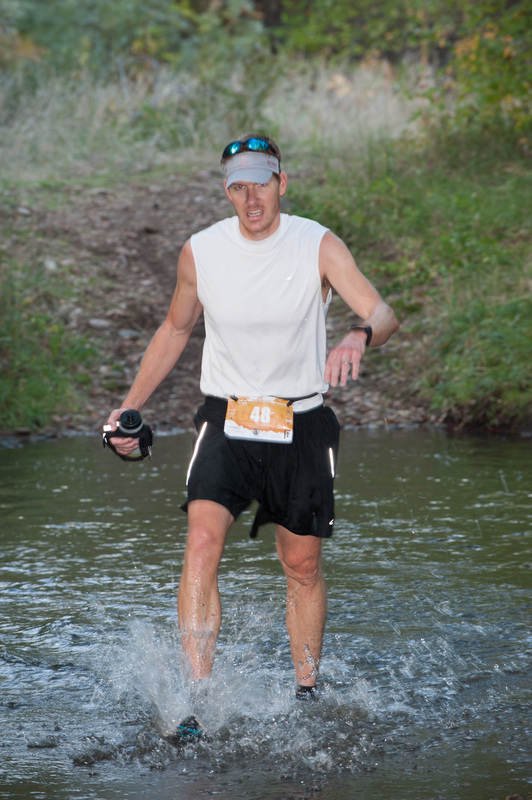 I was happy about that because nobody was taking pictures at my 50K so I had not visual proof I ran! Great report Mike!! I was going to email you after seeing your name in the results. Man, just imagine how you’ll feel when you aren’t sick – 100 miles no prob! Thanks Dave. Just training up Zion 2013! Really enjoyed your report, Mike, and could relate to it 100%. A fantastic result in just your first ultra – congrats! Sounds like you have a solid ultra career ahead of you! Thanks Stu! I was happy to finish and I learned that I have a lot to learn. I read your RR and I’m sorry to hear about the DNF. What happened to you (injury weirdness) was my absolute biggest fear on the day, so I can really empathize with how you felt. You’ll be back I’m sure and maybe we’ll cross race paths in the future. Hey great run! I tried to keep up with you guys but you dropped me in mile three. Thats me in yellow behind you in mile one. Boy can I relate to the training issues this summer. Hey we both finished our first 50 I was 9:58. Great day and great report! Thanks! And big congrats on your finish too! You were a lot smarter than me to back off on that first lap, I paid for it later. Who would think a 9 minute mile would make you pay??! I love what you guiys are usually up too. Such clever work and exposure!